Quipus were complex assemblies of knotted ropes that were used in South America as a data storage device and played an important role in the Inca administration. Only a handful of specialists could use and decipher them. Their meaning mostly remains a mystery but it seems that color, relative position of knots, knot types and rope length were used to encode categorical and quantitative variables. 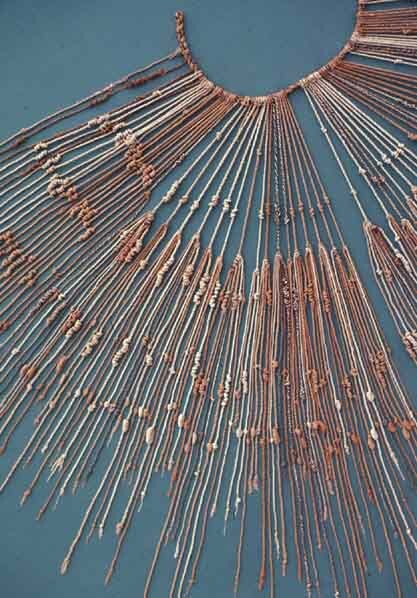 The oldest known Quipu is 4600 years old. In the late 16th century quipus were still being used by Peruvians until the Roman Catholic church decreed they were "the devil's work" and had most of them destroyed. Paul Beynon-Davies (2009) Significant Threads. Dead Media Archive Peruvian Quipu. Left image from https://courses.cit.cornell.edu/quipu/, right image from Beynon-Davies (2009). The term 'Peruvian Quipus' is wrong. Peru didn't exist as a country or culture or whatever when the quipus were developed. The Incas develped such a storage means (e.g. accounting) long before Peru was founded. Please correct such a mistake. Possibly a better term would be: ' Inca Quipus'. Thanks a lot Erick for this rectification. Problem fixed. Thanks for your thoughts. Deciding on what qualifies as a visualization is tricky, as there is no consensual definition. “Easy to understand” is a sensible but vague criterion: to whom? Amazon tribes likely don’t understand scatterplots. People could build visualizations for personal use (e.g., here) and be the only ones who can understand them.